A special Nile cruise on selected dates only with shorter version from Cairo to Luxor only for 11 nights on additional dates: 23 March 2016. The most comprehensive visit to all the important ancients sites along the Nile of Egypt. 14, 12 and 9 night options available. Scroll down to the price chart for dates. Individual arrival at Cairo airport where our representative will assist you through passport control formalities, luggage identification and portage will greet you. From the airport you will be transferred by a private A/C car to your Nile Cruise. Dinner & Overnight in Cairo. Excursion tour to visit, one of the Seven Wonders of the World: the Pyramids of Giza (Cheops, Chephren and Mycerinus), Cheops is the most colossal ever built. Next is a close-up look at the sphinx - a huge funeral complex guarded by the legendary lion body with the face of king Chephren and The Valley Temple. Then visit The Egyptian Museum of antiquities. On display is a rare collection of 5000 years of art the largest most precious collection of Egyptian art in the world. Over 250,000 genuine artifacts are presented, including an exhibit dedicated to the Tutankhamen collection of treasures, gold, and jeweler, as it was enclosed in his tomb for over 3,500 years before it was discovered in the 1920s when his tomb was excavated. The tour is including Lunch.Some extra entrance fee has to be paid for the mummy room. In the evening we will treat you to a Folkloric show. Dinner & Overnight in Cairo. Enjoy a full day sailing to Beni Suef 115 km south of Cairo, an important agricultural center and historically the Egyptian center of the famous Egyptian linen production. In the evening we invite you for a special entertainment performed by the crew and staff on the ship. Dinner & Overnight on board. Visit Fayoum the oldest city in Egypt built on the remains of a 4000 year old settlement which has been inhabited since per-historic times, known as Crocodopolis since it was dedicated to the crocodile god, Sobek. The crocodile was actually living in a special temple pond and was fed by the priests with food provided by visitors. Excursion to the Hawara Pyramid believed to be the final resting place of the pharaoh Amenemhet III. Continue to Maydom, Pyramid which was originally a step pyramid built for the last ruler of the third dynasty. Drive back to boat will take one and half hour. Dinner & Overnight on board at Beni Suef. Full day sailing to Minya which takes almost 12 hours The city is about half way on the Nile between Cairo and Luxor and it is the birthplace of pharaoh Cheops the famous builder of the admired pyramid at Giza who rained round 2300 B.C. Mona is the Christian Coptic Center in Egypt where after having been lost for 1700 years a surviving copy of the Gospel of Judas was discovered ( The Codex of Tchacos) Retunr to the ship for. Dinner & Overnight on board at Minya. After breakfast drive to Beni Hassan tombs, an ancient Egyptian cemetery from the Middle Period where tombs date back to the 21st cnetury B. C. We will visit 4 richly painted and decorated tombs carved in rock: the Tomb of Baqet III, Tomb of Khety, Tomb of Amenemhet and the Tomb of Khnumhotep with colorful depictions of everyday life in ancient Egypt. Return back to the ship for lunch. After lunch, visit Tuna El Gebel & Ashmunein. One hour drive from Minya dock to Tuna el Gebel to visit the temple -shaped Tomb of Petosiris, tomb of Isadora the tragic girl from the Roman period of Eghypt whose drowned body has been mummified and displayed in her mausoleum. We will also visit the sacred catacombs of Thoth, the ibis-headed god. Then drive to Ashmunein to visit its the open air museum with its massive baboon statues, the remains of the Temple of Thoth and the sanctuary of Amun. Return to the ship. Dinner & Overnight in Minya on baord..
Sail to Tel El Amarna (6 hours). After lunch, visit Tel El Amarna site, the eerie remains of the capital city of pharaoh Akhetaten, the "heretic" ruler who believed in only one god. Visit the remains of his palace and the royal tomb once housed the body of this famed ruler, then return to the ship to sail to the town of Asyut on the west bank of the Nile. Dinner and overnight on board. Visit Abydos Temple from El Balyana which is a 20 minutes drive. The ancient city is one of the oldest ones in the world already inhabited before Egyptian dynastic times as early as 6000 B.C. predating the time of the first pharaohs. Abydos is one of the most important sites in Egypt in its heydays featuring many secret temples and the Necropolis. The highlight of the day is a visit to the Temple of Seti, a warrior ruler from the 19th dynasty of pharaohs who captured the city of Kadesh from their enemy, the Hittites and was the father of Egypt's greatest ruler, Ramses II. This morning after brekfast we drive to Dendara temple complex an other important site in Egyptian history. View the Temple of Hathor, the Egyptian Goddess of love, joy, feminism and maternity. She is usually depicted as a slender "cow" holding the sun disk among two of her horns. The temple was the place where the famed Dendera Zodiac relief was found depicting the ancient sky. It is on display at the Louvre. Return to boat and sail to Luxor. At night Belly Dancer party. Breakfast. Visit the Karnak Temple, which is a serious of temples, built in different reigns. Starting by the Avenue of Sphinxes visit the Unfinished Propylon, the Hypostyle Hall with it's 134 gigantic columns, the Obelisks of Queen Hatshepsute and Tutomosis III, the temple of Amon adorned with lotus and papyrus designs, the Granite Scarbeus of Amenophis III and the Sacred Lake. Then visit Luxor Temple, It was known in the New Kingdom period as Ipt-Rsyt, which means the southern shrine. This was to differentiate between this Temple and Karnak Temple, which was the northern house of Amon Ra. Sail to Edfu. At night GALABYA PARTY. Dinner & Overnight on board. Morning visit The Edfu Temple (Lies in Edfu town, 123 km north of Aswan on the west bank of the Nile. It dates to the Ptolemaic period. It was dedicated to the worship of god Hours represented as a falcon. It is one of the most beautiful Egyptian temples, distinguished by its huge splendid structure that blends Pharaonic and Greek architecture. Its grandeur competes with Luxor temples. It is the second largest temple after Karnak. It also houses the Nilometer and a huge pylon at the entrance). Sail to Kom Ombo and Visit the Kom-Ombo Temple (Located in Kom Ombo town, 45 km north of Aswan. It is built on a hillside overlooking the Nile. This temple was constructed in the Ptolemaic Roman era for the worship of god Haroeris and Sobek, the crocodile god. It is noted for relief engravings on its walls which show ancient surgical tools, bone saws and dentistry tools. Nearby there are three mummified crocodiles. They are now in Hathor's chapel). Sail to Aswan. Dinner & Overnight in Aswan. After Breakfast, Excursion tour to visit, Philae Temple (The Temple of Isis is one of the greatest Temples in Egypt and it occupies about a quarter of the island. It is the main Temple on the island, with its huge, complete, pylons and beautiful scenes) and High Dam (One of the most outstanding architectural achievements of the twentieth century. It was constructed to replace the old Aswan dam built in 1902. The High dam was constructed to protect Egypt from the floods as well as providing irrigation and electricity all over Egypt. It is 3600 meters long. Visitors can easily locate Lake Nasser which is a huge water reservoir). At night Nubian Show Party. 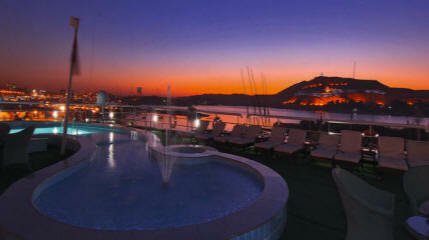 Dinner & Overnight in Aswan. After breakfast, Disembarkation. Check out from the Nile Cruise. Possibility to add a side trip to Abu Simbel with its 2 fantastic temples of Ramses II and his favorite wife, Nefertari. * Accommodation on board of the Ms Hamees Nile Cruise on full board on main or lower decks. Guaranteed upper deck supplement: 10%. * All airport transfers by private deluxe A/C vehicle. * All Nile cruise tours and shore excursions. ** English-speaking tour guide during tours as mentioned above. Extra nights in Cairo, Luxor or Aswan can be added.